The coefficient of variation (CV) is used to compare the variability of two data sets with either the same or different units such as ticket sales to the number of tickets sold or the prices of a commodity to the quantity sold. 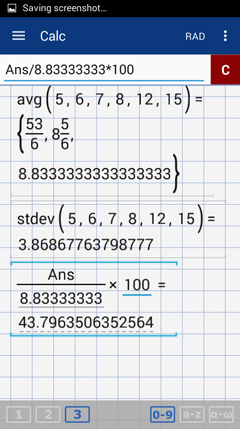 CV is the percentage equivalent of the standard deviation relative to the mean of the distribution. 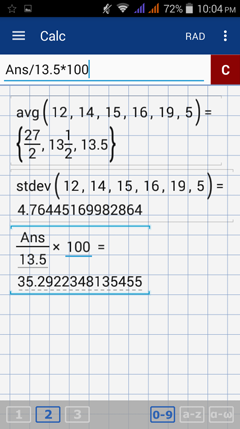 To calculate the CV, divide the standard deviation by the mean and multiply the result by 100%. When comparing data sets, a larger CV implies higher variability. Which data set has more variability? 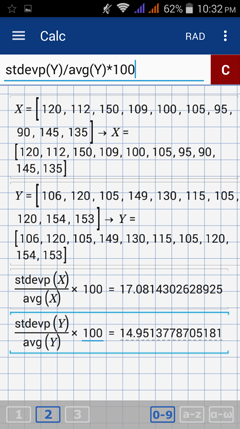 Find the mean and standard deviation of each data set. 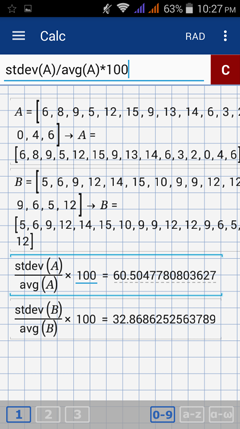 Because set B has a higher CV, its values have a higher variability than the values in set A. Enter each data set as matrix. 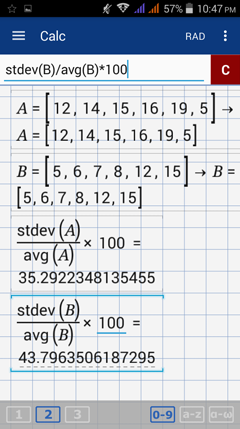 Use the syntax: stdev(A)/avg(A) × 100 to find the CV of data set A and stdev(B)/avg(B) × 100 to find the CV of data set B. Note: If the data set represents a population of values, use stdevp for the standard deviation. 1) Samples of 10 math scores were taken from classes A and B respectively. Determine which class's math scores have less variability. 2) The weights (in pounds) of all 10 supervisors and managers at two companies are listed below. Which weights have more variability? 1) Enter the data sets in matrix form. Since the CV for the math scores in class B (32.87%) is less than the CV in class A (60.50%), data set B has less variability. 2) Enter the data sets in matrix form. Since the CV for company X (17.08%) is higher than the CV for company Y (14.95%), company X has more variability in the weights of its supervisors and managers.